What is the ‘State of the Black Athlete’? There has been an unspoken expectation and, more recently, an apparent insistence that athletes’ opinions and passions are to be kept quiet. 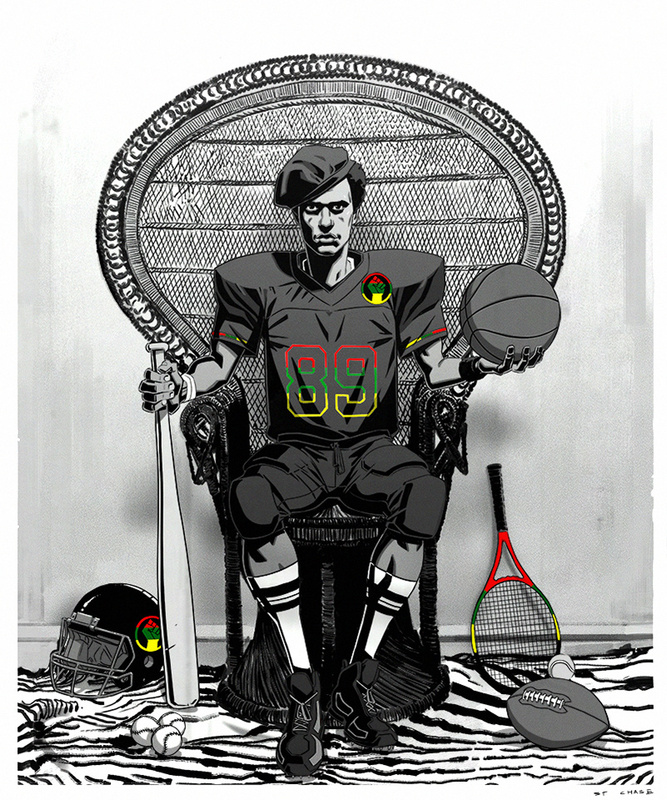 But the cultural resonance, political awakening and activation of the black athlete has pushed back on this narrative. 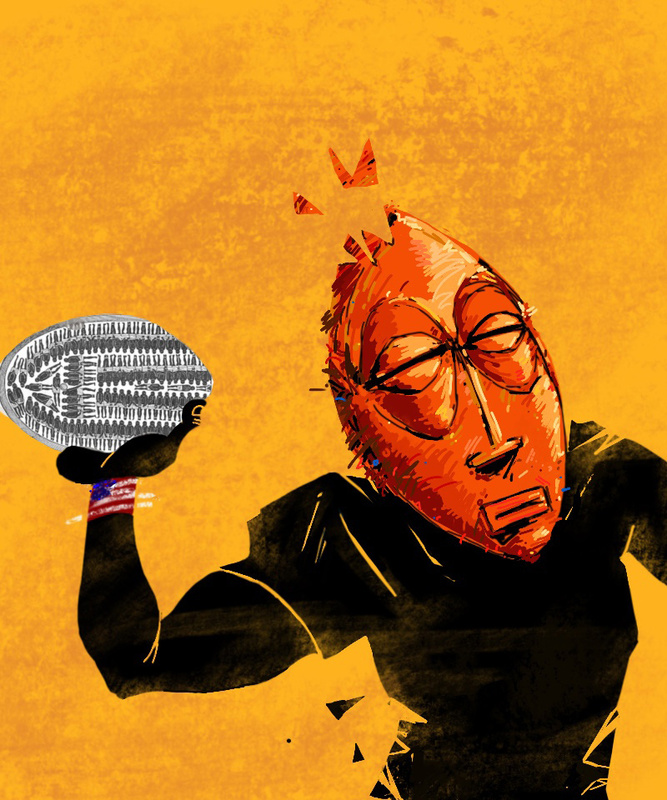 We asked several artists of color to examine and interpret the current “state of the black athlete.” Here’s what they came up with. I often find that no matter the sport, brothers in the game continuously have to prove themselves worthy of the pedestal they are heavily burdened with. I say brother because to me, every black athlete represents someone like myself — a black kid chasing his dreams — finding inspiration in the actions of the people already paving the way. Represented here is Anthony Joshua’s raised clenched fist after he defeated Wladimir Klitschko. To the many black youths who happened to be watching that day, witnessing that gesture meant more than just a show of celebration. This gesture symbolizes a show of solidarity. My goal with this illustration is to address the commonalities between black professional athletes and the black victims of police violence — it highlights the incredible amount of responsibility black athletes have and the role sports fans play in the current wave of athlete activism. 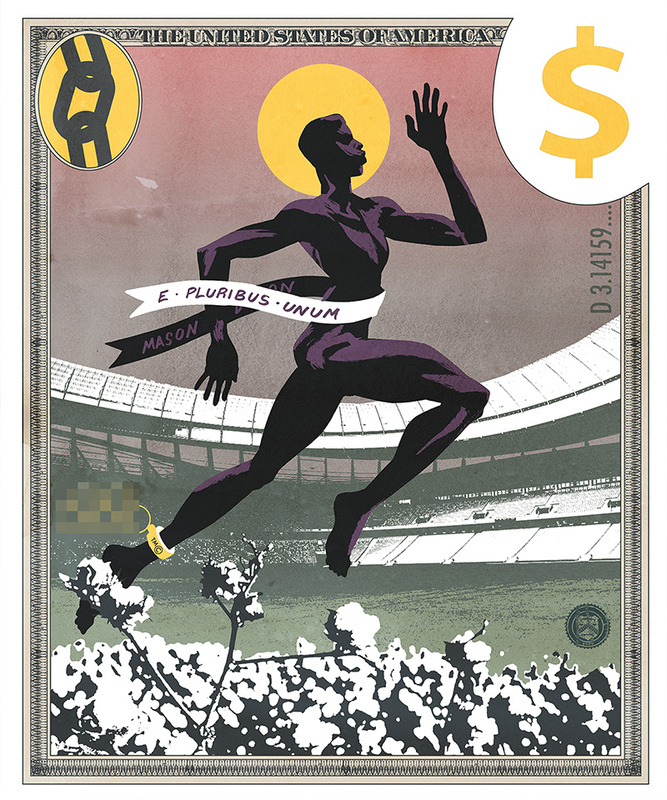 The sprinter in the illustration is focused on the finish line, while his shadow represents the young black victims of police brutality, symbolizing the constant fear that all black men and women face in today’s society. Both the sprinter and his shadow are running away — in the same direction, illustrating the chilling similarities between black professional athletes and the victims we see on the news. The crowd supporting the runner changes from sports fans (right) to protesters/activists (left). This begs the question, who is the black athlete competing for? How has this wave of black athlete activism changed the mentalities of sports fans? I wanted to capture black athletes in a contemplative state. These competitors have or have had the ability to reach so many people — it’s a great responsibility, but can also be a great burden. Athletes, in general, already have to deal with so much: unwanted attention, pressure, rumors, performance anxiety, and even more. Black athletes, have all that on top of feeling as though they aren’t 100 percent accepted in their own country. Today’s current state of affairs feel special. 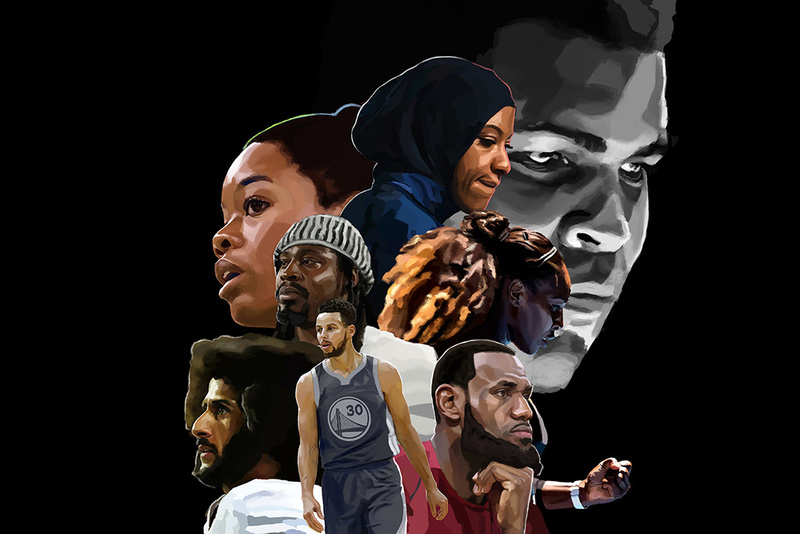 I think it’s a time where the life of a black athlete/person is so much bigger than the self, and the athletes in my illustration represent the contemplation that comes with it. 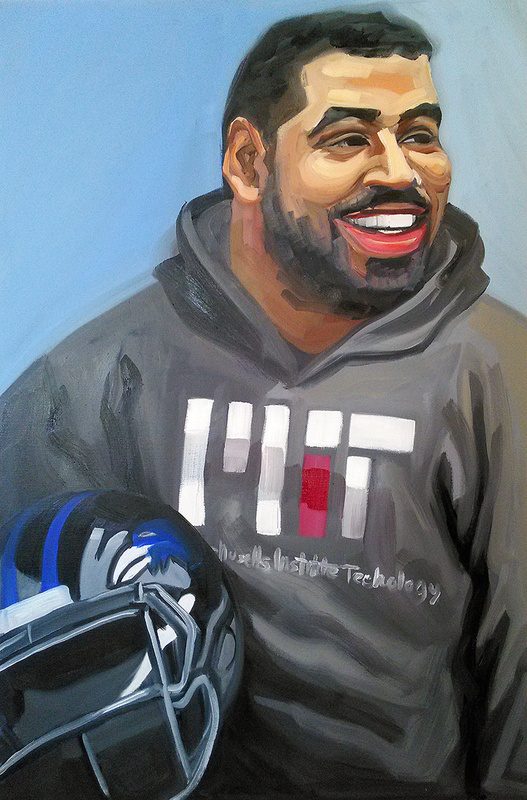 John Urschel, a former offensive lineman for the Baltimore Ravens, retired in 2017 to pursue his studies as a doctoral candidate in mathematics at Massachusetts Institute of Technology. His retirement came suddenly, just two days after a study of chronic traumatic encephalopathy (CTE) found nearly all former NFL players who donated their brains to science had signs of CTE. It seemed the two were connected. Urschel knows the all-too-real statistics that injury risk is high and the average NFL player’s career spans between two and five years. He should inspire the next generation of would-be ballplayers in any professional sport that their studies in college are not supplementary. There is a life after the NFL. I appreciate him as a Renaissance man. What Huey P. Newton has taught me is that I have the power to change my condition, and it’s vital that we stand up against the unjust and fight for what we believe in, even if the cost is high. Until these players start worrying about the issues concerning the state of black people in this country and not about their paychecks, they are still a part of the problem. Yes, you may lose your job, but is that job more important than the condition of your people? Young black teenagers being gunned down in the street every other week? We all should have the courage to sacrifice for the greater good. What would these leagues be without black people anyway? I likened the movement of sprinter Allyson Felix to when a caterpillar turns into a butterfly. 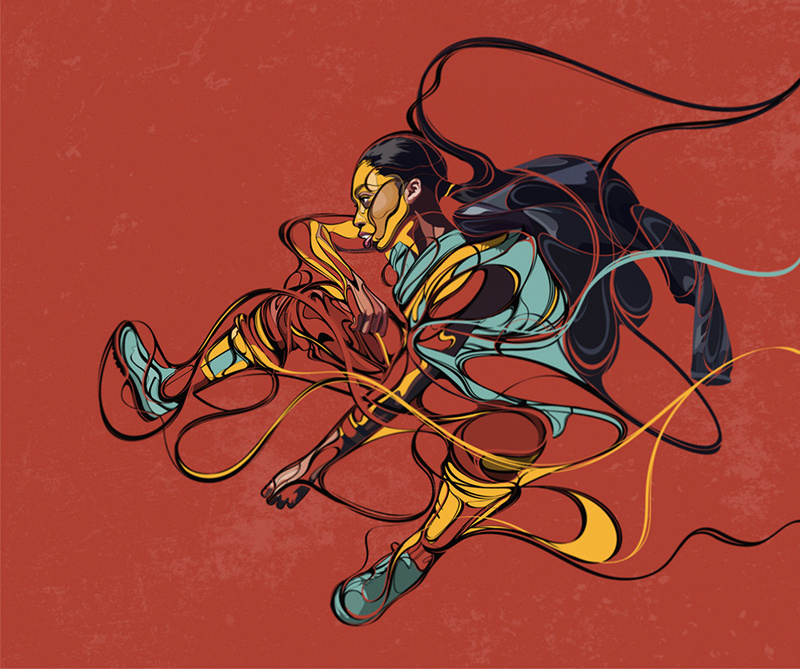 Representing Felix overcoming obstacles faced by a black woman, especially in the athletic world — just dominating. I am drawn to her composed personality while being able to be strong-willed at the same time. She really represents the metamorphosis of a butterfly — in all her beauty, swiftness, and, most importantly, freedom. In a time where black bodies are on public display and seemingly viewed to hold no value, I have attempted to find a way to turn tragedies within the black community into works of art. 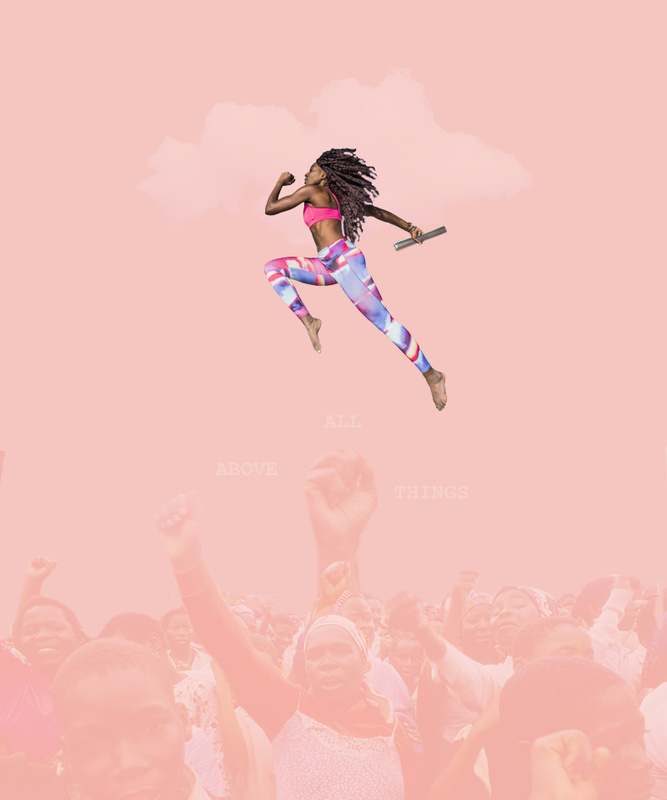 “Above All Things” represents the ability, and, more importantly, the necessity for women of color to go above and beyond in all we do just to receive fair recognition. The expectations are higher for us. We don’t have the luxury of mediocrity when it comes to providing, performing or competing. So we use our excellence as a form of protest: a demonstration of strength, acceptance, womanhood and visibility. The state of the black athlete is conflicted. Athletes grow up simply loving the game. As they grow older, outside factors come into play that can inhibit that love: notoriety, fame, special treatment, money, etc. Players can also become public figures and role models. Black athletes are stuck between these two worlds. As an athlete, you have the keys to success to take care of yourself and your family, but on the other end, you sacrifice your voice and ability to speak on anything political — you’re told to stick to the game. As a black athlete, you’re expected to enjoy your riches and fame in exchange for your voice, choices and ethics. This piece references the Afro-futurist interpretation of the slavery project in the Western Hemisphere as a centuries-long genetic experiment, as well as the Sankofa concept of looking backward and seeing the future. In choosing materials to make up the image, I imagine the middle passage as a thrusting or throwing forward into the future of mass amounts of human capital. With the crown of shards, I seek to reference the toll that many professional sports take on the body and also the regal state of being at peak physical form. The statement on the tape, “PLAY,” not only states a command but also commands attention. 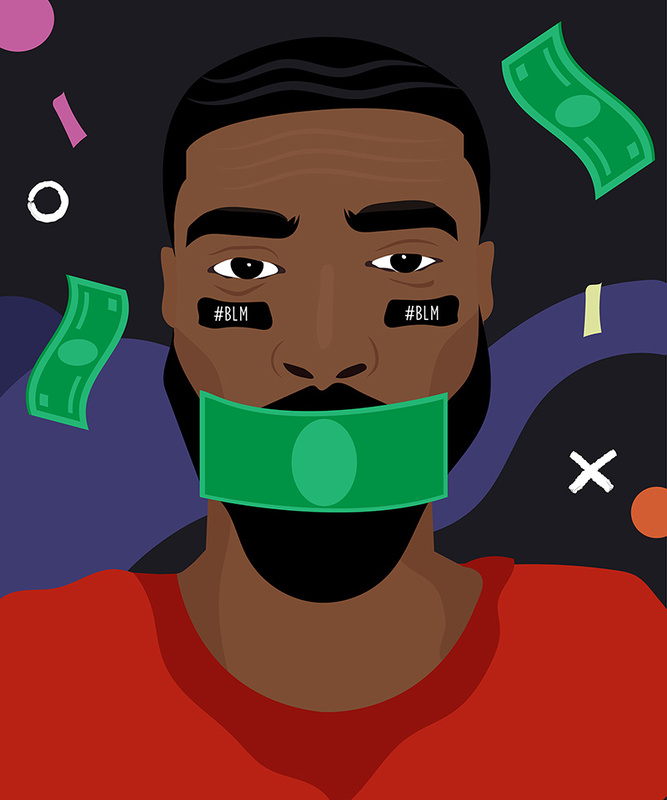 I wanted the art to speak to different sides of the argument: players who comply, players wanting to exercise their First Amendment rights, and fans for or against athletes’ choices. 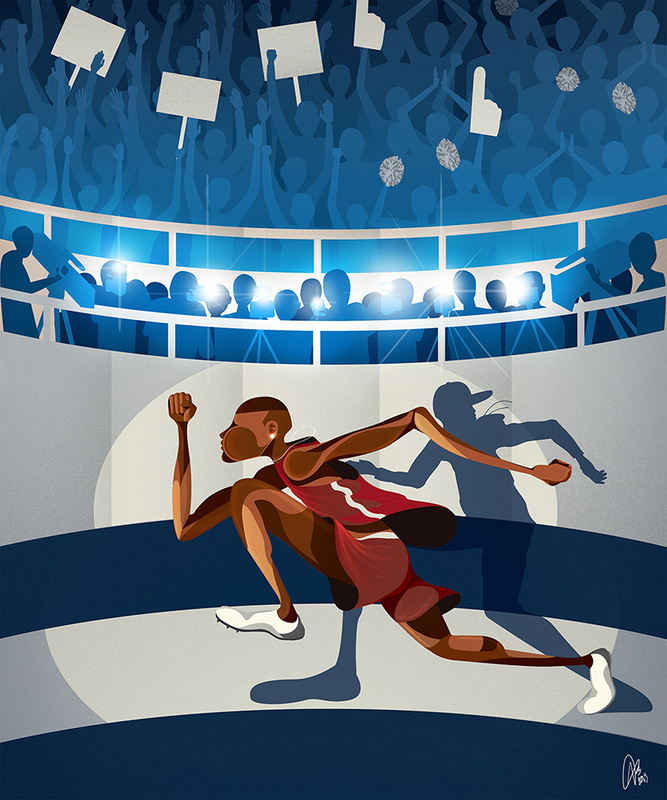 In the illustration, a spotlight is placed on an ambiguous African-American athlete who is shirtless, which suggests he’s baring it all. For the athletes who comply with “shut up and play,” the red arrow symbolizes the potential for them to excel or “climb the ladder to success” in their sport. The athlete who complies thrives. For the athletes wanting to exercise their First Amendment rights, the intense stare reflects the absurdity of being told to shut up and play. 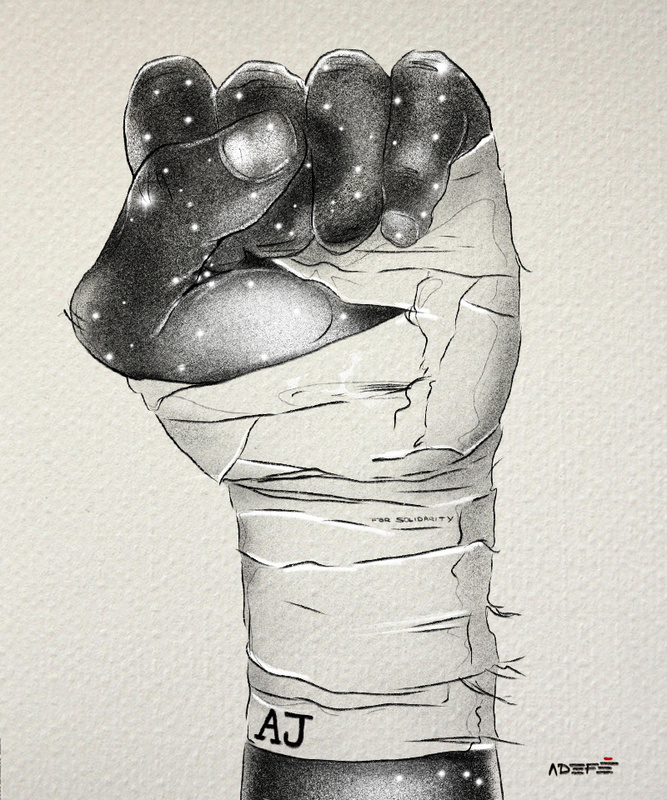 The athlete has the complex choice of raising one fist (in protest) or raising both fists (in victory). For the fans who are not affected by or disagree with the views of athletes, the sticker across the athlete’s mouth, in their opinion, should become an essential part of the uniform. I want this illustration to beg the questions: Should you keep quiet and find contempt for living one’s dream? Or should you use your dream as a platform to speak for those whose voices go unheard at the expense of sacrificing one’s dream? I asked myself about the political role of the black body within a racist, consumerist paradigm and how that plays out in sports. For this image I thought about how athletes may work through these very same questions through sports. From Muhammad Ali’s name change to the Black Power fists of the 1968 Olympic Games, to Colin Kaepernick’s act of taking a knee — we are given expressions, symbolic abstractions, symbols that challenge us to think. I think this is the most radical act: to be challenged to think, to ask questions. Explaining artwork is a trap. Formally, the work is a dialogue with the works of Aaron Douglas and Tadanori Yokoo and the movements to which they belong. “I am not going to stand up to show pride in a flag for a country that oppresses black people and people of color,” said Colin Kaepernick. In the face of explicit and implicit racism, everyday people rise selflessly to address social injustice. 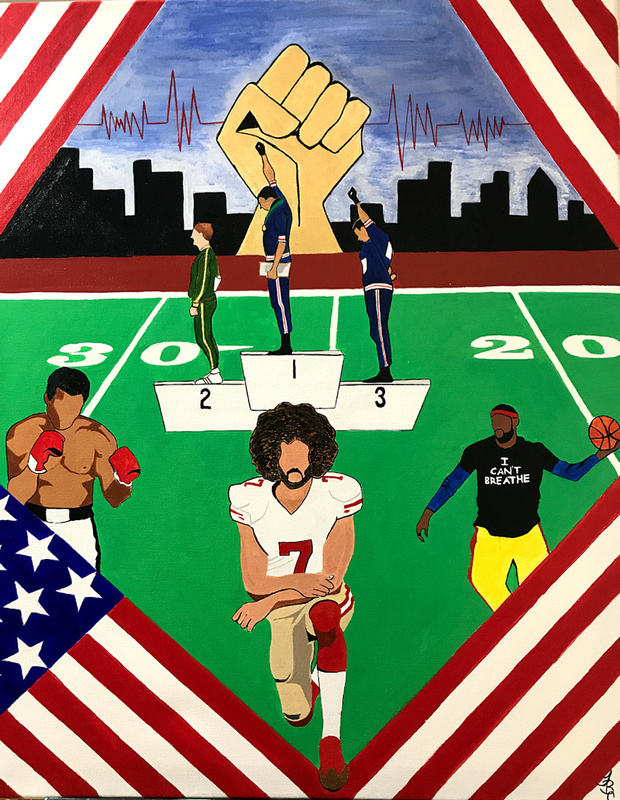 Among these people are African-American athletes, such as the ones in my painting, who use their public platform and their First Amendment right to solidify their purpose as change agents. Their primary goal is to rewrite the narrative of oppressed people and afford them a pathway to upward mobility. Some may say we have come really far, but have we really? What would you say?